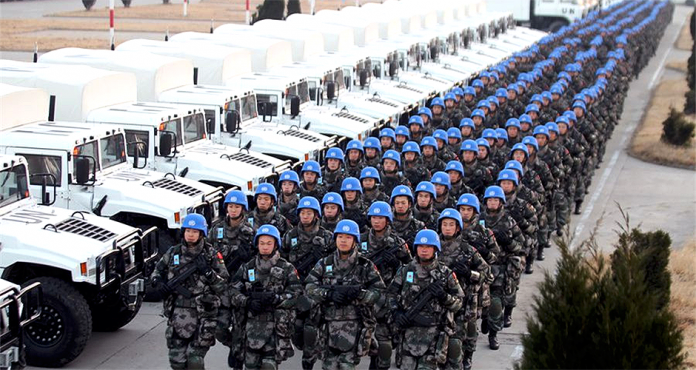 Did the US just agree to allow UN Foreign Troops to police the streets of the USA? Americas worst nightmare potentially just got the green light. The blue helmets of the UN are coming to police the streets of the USA. Foreign Military is now allowed to police the streets, arrest, and use force in combat. In May 2016, the USA approved a set of principles that give the green light for UN peacekeeping troops AND POLICE to use force to “protect” citizens in armed conflicts, but the agreement does not specify exactly where. The Blue Helmets are coming, and the American police force could now be a part of a global police force. These principles are illegal according to the Constitution, but somehow the US has agreed to them. The Obama administration has corrupted the entire American way of life and is preparing the way for the dictator Hitlary to use any force necessary to remove the second amendment from citizens. It has long been discussed that the people of America would win a war against the police and military, and it has also long been considered that the UN would embed themselves within our borders for when the day of conflict comes to reinforce the police and military. Now, that day is in view; and the government of the United States is making dangerous plans which will begin the ugliest war in US history. Over the course of the last few years, a lot has transpired from the Patriot Act to the NDAA, to tyrannical gun control, and many more bits of legislation which undermine the citizens rights. Over that time, while many Americans lay asleep, the foreign troops were arriving in droves. Vast amounts of reports from all over the USA have reported sightings of foreign military on our streets. However, under these new principles, they legally could be here under the UN’s principles. U.S. Ambassador Samantha Power told a high-level U.N. meeting Wednesday focusing on the responsibility to protect civilians that the United States was “proud” and “humbled” to join 28 other countries that have pledged to abide by the 18 pledges. U.N. peacekeepers from these 29 countries are now required to act in cases where civilians are in danger. “The Kigali Principles are designed to make sure that civilians are not abandoned by the international community again,” she said, recalling how U.N. peacekeepers left Rwanda before the 1994 genocide and Srebrenica before the 1995 massacre. The United Nations is now required to act in the times of crisis or conflict. The question is, does that include within the borders of the United States under the new Kigali principles? Over the past few years, a lot has come about. Which would lead America to this very point, where the possibility of UN forces would be allowed on US soil. The UN is weeding its way into the US to form a globalist government, but not without invoking the Arms Trade Treaty, which will revoke the second amendment (illegally). Understand the deception, and how the UN will further its agenda; by any means necessary. “GBV is a human rights violation and, when carried out during armed conflict, is a violation of international humanitarian law.” The Orlando shooting was all apart of the plan to come for guns. The Obama administration on July 1st, 2016 passed another executive order for “Policy on Pre- and Post-Strike Measures to Address Civilian Casualties in U.S. Operations Involving the Use of Force”. This executive order appears to be the beginning of the use of military force on American soil. 2. Translate this executive order into actionable policies with an office of civilian protection under the DOD. 3. Coerce other nations to adopt “learn” about civilian casualties as a barter item for weapons and training. 4. Establish a permanent program for making amends to those unintentionally harmed by US operations. This would be like the vaccination injury program where it is a lot of hot air to legitimize criminal activities. All the pieces are coming together, and all of it can be summed up under the United Nations agenda for 2030. So what do you think, did the US government literally just sign over America? Where did all the ammunition that Obama had FEMA buy go? He set up camps in the US.